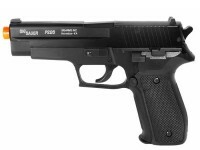 The SIG Sauer P226 airsoft pistol is a realistic version of the preferred sidearm of the Navy Seals and British Armed Forces. 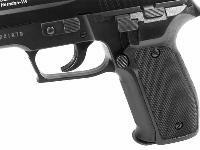 This spring-powered pistol features very few breakable components due to its simple & reliable internal components. 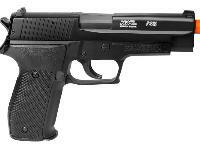 The gun features a full metal slide, a 12 rd magazine, and a shot velocity of 256 fps (using .20g BBs). The BAXS hop-up unit lets you adjust the gun's long range shot trajectory for faraway battlefield targets. 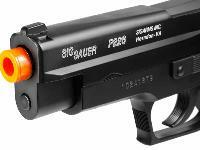 This unit utilizes three points of contact against the BB, spreading out the weight evenly as each BB is fired from the gun. 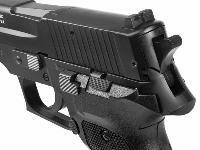 The P226 is a great sidearm choice for intense airsoft skirmishes. Must be manually cocked for each shot. 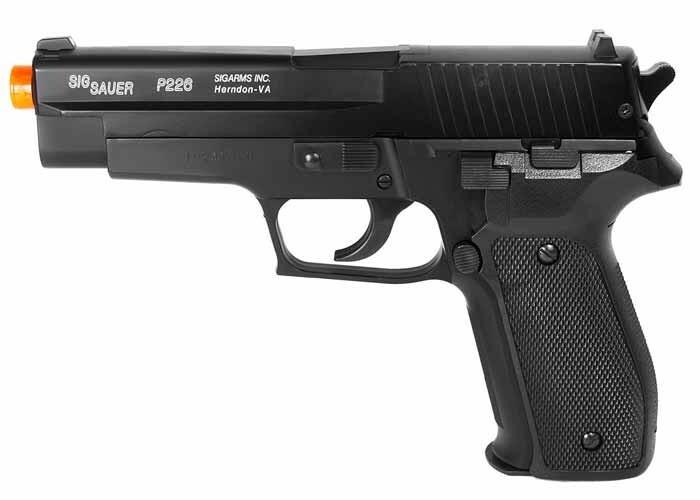 Things I liked: Compared to a real P226, the dimensions are almost spot on. Decent quality metal frame (although is hampered by subpar plastic components, see below). Hits a pop can consistently at 15 ft. Things I would have changed: Design with a stronger frame. What others should know: DO NOT BUY this product. Apart from the 'metal slide' the rest of the frame is low quality plastic. Three cracks in the plastic frame developed after putting less than 50 rounds through it (just received it a day ago). The cracks developed around the slide release lever (lever can be seen in image 7 of the product pics). 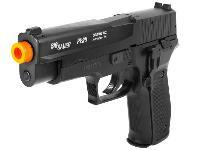 As a prop this gun may be useful, but it was designed for airsoft and fails at that task. Things I liked: Metal slide is nice. 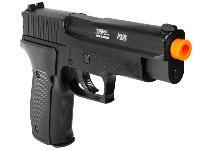 Shoots well even though I purchased it as a movie prop and not to play airsoft with. Easy to take apart. Nice feel. Great price! Things I would have changed: Not sure if it's a 1:1 replica, felt a touch small. Something to lock the slide back would be nice. Clip release was a little too easy to accidentally eject the magazine. What others should know: Orange tip was a pain to get off. Tried hot water, then went to a hair dryer. Got most of it off (Sharpied the rest), but ended up warping the plastic sleeve around the barrel a little. Again, I was using it as a movie prop, so the tip had to go. Things I would have changed: maybe a bigger mag but amazing! Does the slide lock back on this model? Might be difficult for kids and women, but should be OK for teenage boys. Just remember to not point the barrel downward while cocking, or the bb might fall out.